FTC: Sponsored by Hot Wheels, all opinions are my own. Are you running out of creative ways to entertain your little one this summer? I am always happy to greet a new day of sunshine, yet my imagination is running thin on how else to occupy my curious three-year-old. Add a rainy day into the equation, and you might find me hiding in the bathroom from my son’s endless energy. 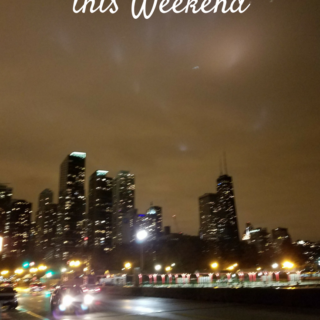 However, this morning I got enough sleep and let my creatively run wild thinking of different ways I can encourage my pre-schooler to use toys we already have for new fun activities. 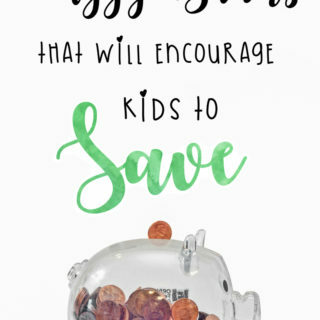 Think about it, if only you could get more out of the same toys – the kids would have more fun without us spending more money. 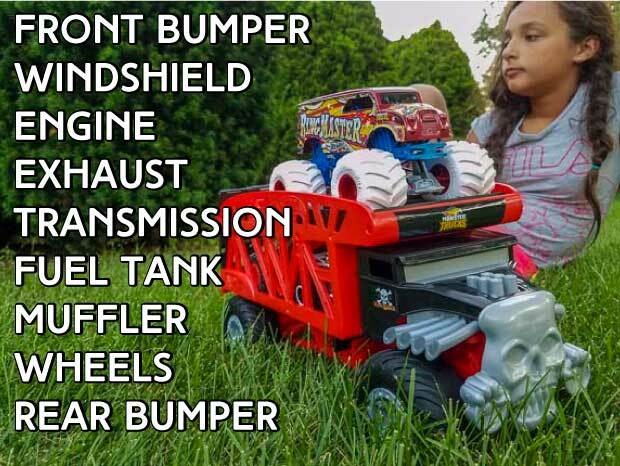 While most kids around this age only use sounds while operating their favorite trucks, it is a perfect opportunity to teach your child a few new words. It will sure come handy the next time you read a book about trucks as your child will show-off his new vocabulary skills. Encourage your child’s storytelling skills while transporting small trucks, unloading them or jumping over tough obstacles. Most of the time our toddlers and preschoolers learn the cause and effect when they get in trouble – give the dog a haircut and suffer the consequence. However, there is a safer way to do this – teach them that a toy truck will travel down a ramp on its own but needs to be pushed. Expect this to be a lot of fun for you and your child. 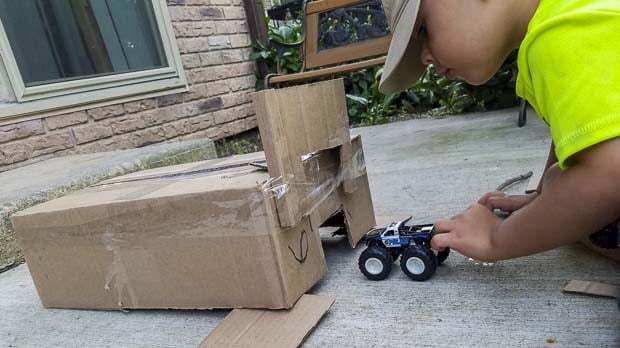 Just think of what kind of ramps you can build together using anything from disposable plates to cardboard boxes. Make the truck climb, roll, and flip! Hot Wheels trucks are known for their durability, and that makes your education even more fun – SMASH IT! CRASH IT! MUDDY IT! While having good old fun, don’t forget to stop and explain the educational part of the process though. 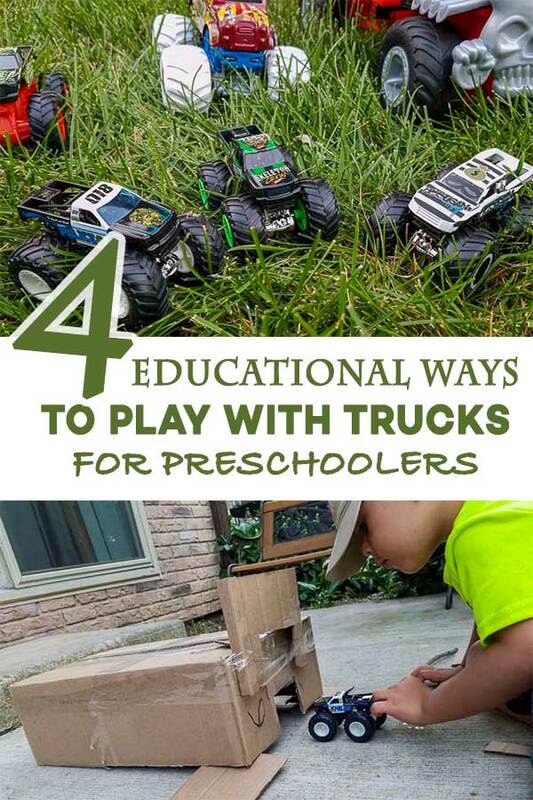 With everything you already built for your trucks, it will only be natural to also improve your child’s fine motor and hand-eye coordination skills. My son loves rolling his vehicle into the tight-fitting garage doors and celebrates every time he can get it in on a first try! Guiding the trucks up and down the ramps is another excellent way to improve these skills. 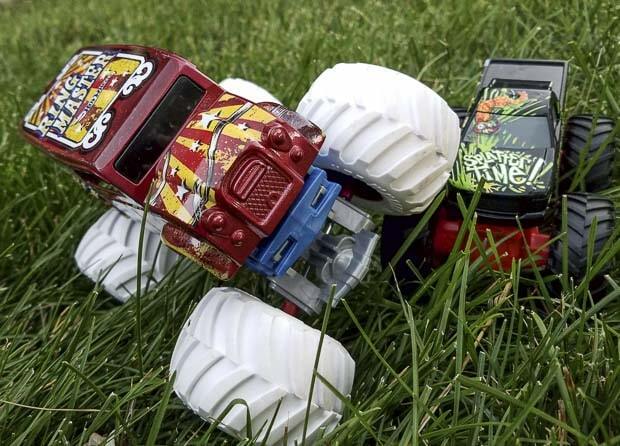 This Big Monster Mover transporter inspired by the iconic Bone Shaker is fine motor skills and a hand-eye coordination playground of its own. With a wide rear ramp, two levels for truck delivery, and wide stable wheels, your preschooler can practice rolling giant tires over obstacles, operating a foldable ramp, lowering upper platform and loading, unloading trucks, and so much more! Let him be the Boss! We all know little kids want to be in charge of everything. Being the youngest in my family, my three-year-old craves power and independence. Hot Wheels Monster Power stage is just the right place to pass on the torch to your overly independent child and let him be the boss! You might find him creating a story about the mighty Splatter Time Truck that defeats all odds and wins a competition or will catch him launching his Ring Master truck into the air. Let him explore the power of the open play with no guards. This might also be a perfect time for you to check out an audiobook you always wanted to listen to or enjoy a well-deserved cup of tea. Good ideas! There are so many fun possibilities with these trucks! I definitely like encouraging lots of imaginative play. These are all such great ideas. I think it’s genius to take a fun toy and use it to get the kids excited about learning. What great suggestions! 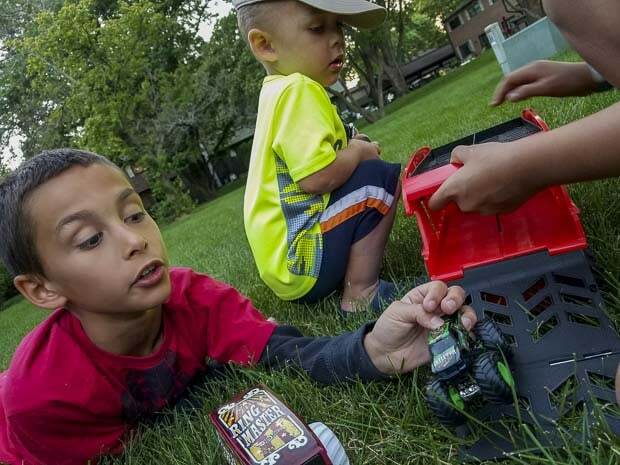 We played a lot with Hot Wheels when we were young, but never had monster trucks. Now I wish we did! My son used to love Hot Wheels when he was younger. I need to get some of these Hot Wheels monster trucks for my granddaughter. So fun! My son is almost 10 and STILL plays with this monster trucks! My son would have so much fun with these. 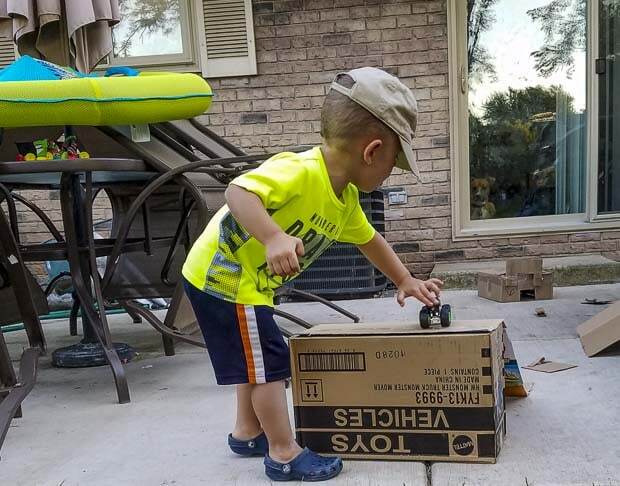 He is obsessed with big trucks! We used to have these trucks. It is shocking to realize just how fast time is going when I look at the toys. Learning through play is a great idea. My son loves monster trucks and Hot Wheels. 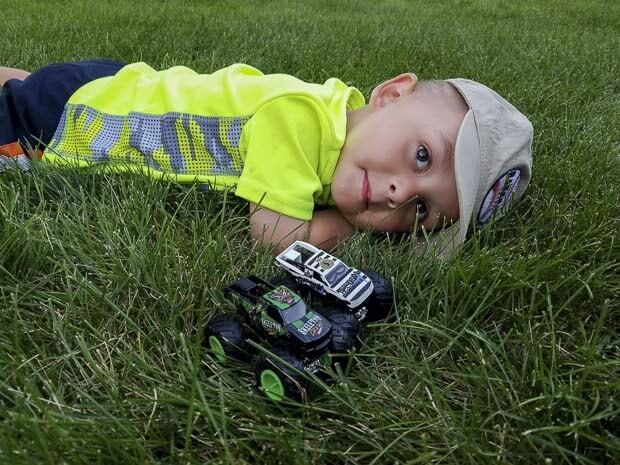 They are so durable..
My grandson loves trucks too. He uses them like a pull toy and loads them with leaves he picks up. He says he is selling vegetables. Haha. I love all the new things he discovers when he plays with his monster trucks.